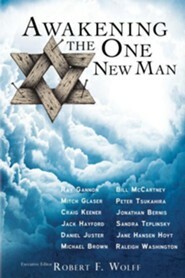 Normally, discussions about One New Man focus on Jew and Gentile needing to reconcile. Usually, this conversation breaks down over the place of Israel in the Kingdom and end times. People rarely think, much less act, on the purpose behind the Lord calling us to be the One New Man. The fundamental issue of identity has been overlooked. When people recognize that their true identity is their Messiah, they will be drawn into a closer relationship with God. They have been born into a time where biblical prophecy is confirming that the unity between Jew and Gentile is ushering in a new season of outpouring of the Holy Spirit, and the Lord is calling them to join in. There is a call in this season, as confirmed in Ephesians 2 and 3, for Jew and Gentile to come together as One New Man and to walk as joint heirs in the commonwealth of Israel. When Jew and Gentile come together as One, the Lord has stored up a release of blessing and power that will forever change humanitys destiny. Robert Wolff speaks insightfully at churches and synagogues as well as on radio and television and has served in numerous spiritual leadership positions. He contributes his time and talents to organizations promoting reconciliation of Christians and Jews, including Promise Keepers, Hearts4Zion, and Malkosh (Latter Rain) Ministries. He orchestrates groundbreaking business and ministry development models at home and overseas. Robert earned a Master of Theology in 1998 from Fuller Theological Seminary in Pasadena, California. He also studied at Kings University and Oral Roberts University, both in Van Nuys. He earned his Bachelors degree in Economics in 1970 from Colorado College, Colorado Springs. He and his family live in Malibu. I'm the author/artist and I want to review Awakening the One New Man - eBook.